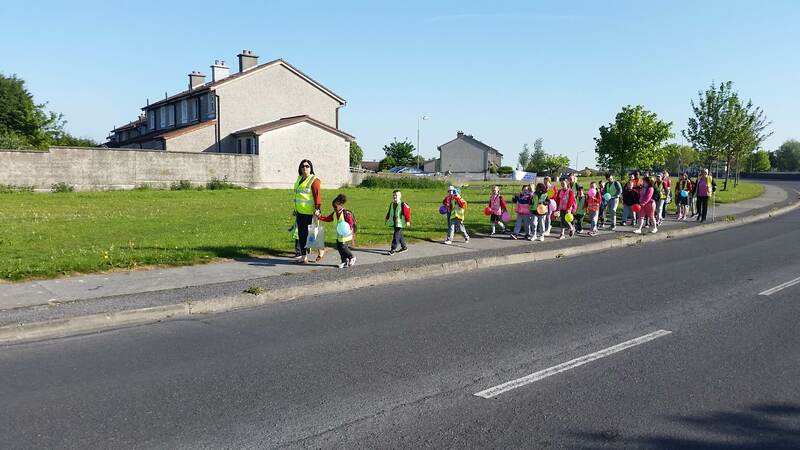 Last September three parents from Ballybane, Galway decided to start walking their children to school. 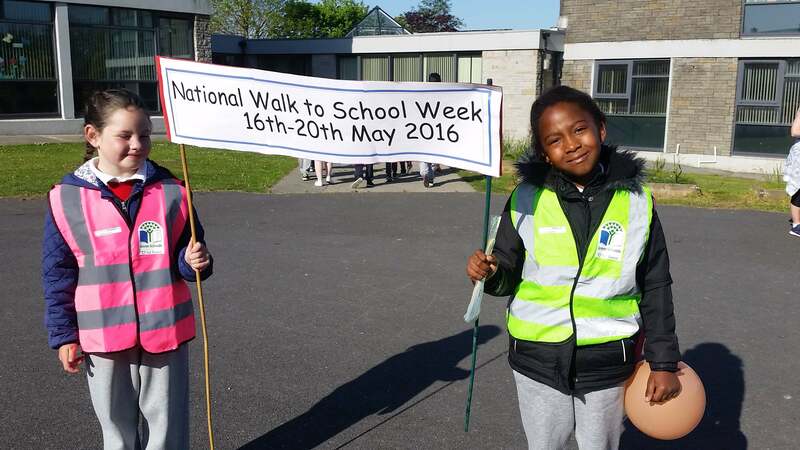 A few mornings each week they would meet at Ballybane church and walk towards Holy Trinity National school in Mervue. Students chatted, parents got to know each other and there was less congestion outside the school. The Ballybane walking bus is now firmly established. It typically runs four days a week with approximately 60 children a day taking part. Both Holy Trinity and St Michael’s are involved in the Green-Schools Programme – in fact St Michael’s was one of Ireland’s very first Green-Schools. This year the two schools have been involved in a pilot project with Green-Schools which involves small focused interventions to encourage sustainable travel. 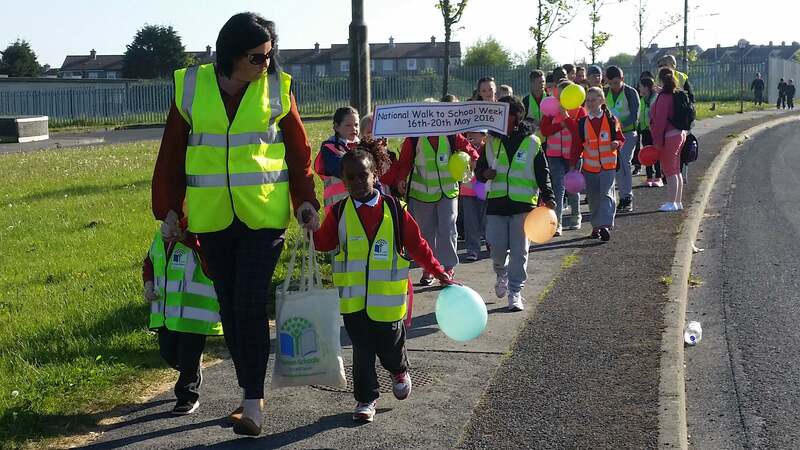 It was decided by the school’s Green-Schools Coordinator Breda Fallon to have a big walking event for National Walk to School Week 2016; the largest active travel school event in the country. In many ways the gathering at Ballybane church on Monday morning, May 16th, was not so different to every other Monday morning; there were lots of happy kids and a few of the usual parents overseeing afairs.The one difference was that there was more of a party atmosphere: balloons and the banners everywhere.This was their time to celebrate a fantastic year of walking to school. Ray Foley, Travel Officer with An Taisce Green-Schools paid tribute to the parents: “I want to thank Margaret Reilly, Catherine Faherty and Angela Cullinane.These ladies are the real heroes. They took it on themselves to do something worthwhile for their community and it’s paying off in a big way.They do it all for the greater good and I and many others very much appreciate that. I must say that they get great support from Breda and the school’s home school liason officer”. Green-Schools is committed to promoting sustainable travel options, including walking, on the journey to school as a real alternative to the private car.